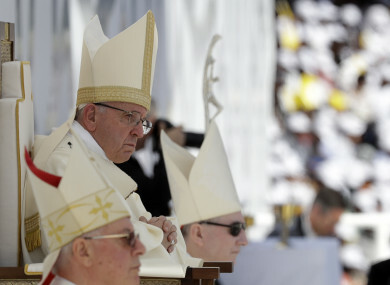 Pope Francis sits in front of the altar as he celebrates a mass at the Sheikh Zayed Sports City Stadium in Abu Dhabi. POPE FRANCIS HAS admitted that Catholic priests and bishops had sexually abused nuns. “There are some priests and also bishops who have done it,” the pontiff said in response to a journalist’s question on the abuse of nuns. He was speaking yesterday on the return flight from his trip to the United Arab Emirates. His admission followed a rare outcry last week from the Vatican’s women’s magazine over the sexual abuse of nuns, leaving them feeling forced to have abortions or raise children not recognised by their priest fathers. I think it’s still going on, because it’s not something that just goes away like that. On the contrary. Email “Pope admits that priests and bishops sexually abused nuns”. Feedback on “Pope admits that priests and bishops sexually abused nuns”.